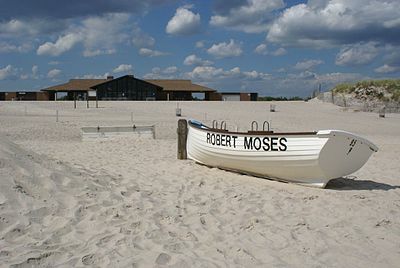 Robert Moses State Park is a beach park on Fire Island open to the Atlantic Ocean and the Great South Bay in Western Suffolk County. Originally it was called Fire Island State Park, but was later renamed in honor of the former president of the Long Island State Park Commission. Five miles of open beach attract swimmers, fishermen and surfers. On the western end of the beach a secluded 18 hole pitch and put golf course offers additional recreation between April and November. Approximately 3.5 million visitors come to the park each year. The park is named after the infamous urban planner, Robert Moses, who is generally credited with designing the statewide park and parkway systems. In 1924 the Long Island State Park Commission obtained the four miles of beach that had formed from shifting sands west of the Fire Island Lighthouse from the federal government. Originally the park was only accessible by ferry until the Robert Moses Causeway was opened in 1864.